The Catholic Message Board • View topic - BIRD!!!! STUPID BIRD!!! Post subject: BIRD!!!! STUPID BIRD!!! For the last three days there has been a juvenile robin attacking the plate glass window in the rear of our house. I guess he sees his reflection in the glass and thinks this is a territorial dispute. No matter what we have tried, we can't seem to scare him off from his futile engagement. Miss Elizabeth is all upset that he is going to hurt himself. We are not talking about a little dance and then he leaves. He has spent all day bashing himself against the glass. Post subject: Re: BIRD!!!! STUPID BIRD!!! We have this problem too! The windows on the western side of our house are tinted and are like mirrors. Our fellow sounds like a jack hammer with his beak knocking and makes the dog go mental. You could dangle a few streamers from the outside of the window. This is sometimes enough to deter them. It is very common with male Robins who are very territorial. He is doing it because it is mating season. Once that ends, so will the Kamikaze attacks. You can hang things as suggested, try pulling the shades, soaping the windows for a few weeks....or just don't do anything and let happen what happens. They usually never really hurt themselves. My parish church has a huge picture window that takes up about 1/2 of the church, to the left of the altar. Occasionally that happens that birds fly to the window with a thud, continually, and sometimes they are found dead on the ground. 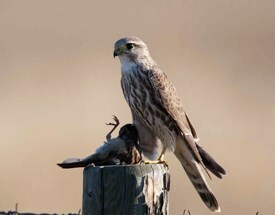 You can also just train a Merlin to do "bird abatement' for you! Ooooooooooooo!!! Dat's de manly ting to do!!! My mom had this problem and she called the Audobon Society and they suggested that she cover the door with newspaper until mating season is over. There was even blood on her door from the robin attacking "the other bird". Newspaper is not the best look for the door, but it will keep the poor bird from hurting himself. We also had a problem with a bird flying repeatedly into windows in our house. Ours was a cardinal and he would fly into our front picture window and basement ground level window over and over and over again. It was really annoying. Sometimes, closing the basement blinds would help. This happened a few years in a row, but seems to have stopped now. The dumb bird probably died. *Texas' first and only Cardinal is named "Daniel". haha.